FINA proposal to possibly change Breaststroke start, again. - Ellis Aquatics: The USA Swim Club of Tracy. FINA proposal to possibly change Breaststroke start, again. 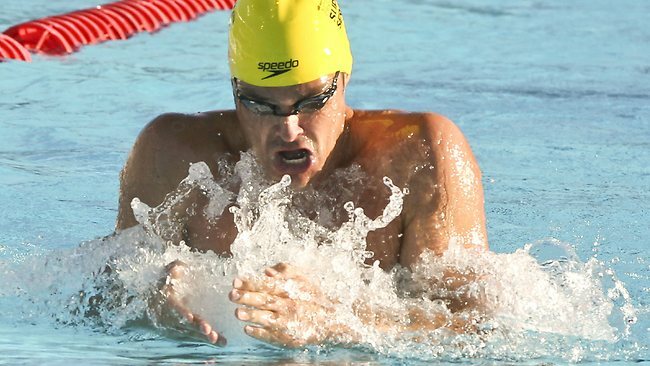 AUSTRALIA'S Olympic breaststroke medalists Christian Sprenger and Brenton Rickard, fear for the future of their chosen discipline if an International Swimming Federation (FINA) proposal to change the breaststroke start is approved in July. Russian Swimming Federation president Vladimir Salnikov has revealed that FINA is considering allowing breaststrokers to do multiple underwater butterfly kicks for the first 15m of the race, a move that many, including Australia's best breaststrokers, believe threatens the integrity of the event. "It will make a mockery of the stroke," Olympic silver medallist Sprenger warned yesterday. "It will change the race completely. "It's a bad move because breaststroke has always been based on technique, more than any other stroke, and that would change." The breaststroke start has become one of the biggest talking points in the sport since last year's London Olympics, when 100m breaststroke champion Cameron van der Burgh, of South Africa, admitted he did multiple underwater dolphin kicks off his dive instead of the one allowed in the rules, unnoticed by pool-deck officials. The splash created when swimmers dive into the water makes it impossible for poolside officials to see what is happening under water directly after the start. Those pushing for the introduction of underwater video to police such infringements have argued repeatedly that FINA should adopt the technology to ensure a fair playing field, but the international federation still seems reluctant. Despite repeated controversies sparked by underwater video of rule breaches (2004 Olympics, 2005 world championships), FINA has refused to embrace new technology to assist officials on the pool deck. However, Sprenger and Rickard believe strongly that underwater video is the way forward. "I don't see why they can't do it," Sprenger said. "Every other sport has gone with the technology - tennis, cricket. Swimming is definitely behind the times". Rickard, a 2008 Olympic medallist, urged the international federation to adopt a "21st-century solution" to the problem of the breaststroke start. "To me, this has been a problem for 10 years and it will continue to be a problem if you just keep making patchwork solutions, like changing the start rule," Rickard said. "Obviously the long-term solution is to use underwater footage to assist the officials. "Allowing a fly kick to 15m defeats the purpose. Breaststroke is quite different from the other strokes and the start should be different. The 15m rule would take the heart and soul out of the stroke. It would change the race entirely, to the point that it would sever any connection with the great breaststrokers of the past." "I'd like to see breaststroke stay the same and be policed better."